Ulcers are an area of inflammation in the horse’s stomach lining, that can advance to an area of the stomach lining being eroded away. What causes my horse to get ulcers? There are many many risk factors for horses developing ulcers, these include (but are not limited to): competition, training, traveling, hospitalization, change in herd dynamics, unfamiliar environments, weaning, stall confinement, lay ups/rehabilitation, changes to/or an inconsistent feeding schedule. Shouldn’t my horse’s stomach be protected against its own stomach acid? A horse’s stomach has two different linings of it, the top portion is unprotected against stomach acid, and is where we commonly see ulcers forming. The bottom portion is protected against the stomach acid, however we can still see ulcers/lesions in this section due to increase in the production of stomach acid. How do I know if my horse might have ulcers? Horses can show a variety of signs, ranging from obvious to very subtle. They can often show signs of intermittent colic, have behavioral changes, become resistant to cinching up the saddle, show weight loss, have changes in the consistency of their manure, grind their teeth, or have poor performance. If you have a foal, be on the look-out for signs of intermittent colic especially right after nursing, diarrhea, excessive salivation, grinding teeth, or laying down more frequently than normal. How do we confirm if my horse has ulcers? The only way to know for sure is to perform a gastroscopy exam. This allows us to pass a camera through their nose down their esophagus and into their stomach. Once we are in the stomach, we can look around and see if there are ulcers on the stomach wall. We can also travel through the stomach into the first part of the small intestine to ensure that there are no lesions there. Does the gastroscope exam hurt my horse? They might feel some discomfort as the tube is initially passed, but once the tube is in the stomach they do not feel it. We do sedate them with a short acting sedative to ensure that they are standing still. Can my horse eat normally before the exam? No, your horse will need to be fasted prior to the exam. Ideally, we have all food removed at 5pm the night prior to the exam, with no breakfast the morning of. We then perform the exam as one of our first appointments of the day so they just get a little delay in breakfast! Okay, so my horse has ulcers, now what? Treatment consists of Gastrogard (which is Omeprazole). This drug causes the acid secreting cells in the stomach to slow down production of stomach acid. Depending on the severity or location of ulcers, we might add in Sucralfate which helps to coat the stomach to and treats the ulcers in the glandular, or lower, part of the stomach. We might also make feed changes such as: adding more hay to their diet, splitting up their grain meals, adding small amounts of alfalfa to their diet or adding a slow feeder hay net so that they can snack throughout the day. Do I have to treat my horse for the rest of its life? We recommend using a preventative dose of Omeprazole during times of stress to help prevent ulcers from reoccurring. Continuing any diet changes that we might have made is also encouraged to help keep the ulcers from returning. 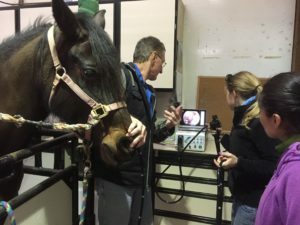 How do I schedule my horse’s gastroscope exam?? Give us a call at (916) 687-6870 to schedule your exam!